Things are really changing over at New Walk Museum, with the Dinosaur Gallery being prepped for the launch of the new gallery in September. As part of this, certain dinosaur specimens which have been spotted all over the museum are now being brought back to their new homes in the gallery. 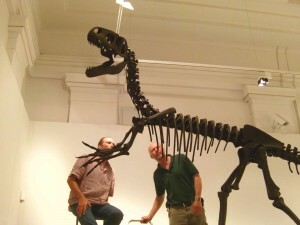 So how was the Neovenator moved from upstairs to the gallery? See our picture below and our Flickr site to find out. You can see the Neovenator along with the other specimens in the new Dinosaur Gallery in September. Leicester Arts & Museums Service manages six museums sites including New Walk Museum & Art Gallery. New Walk Museum & Art Gallery is situated within the historic New Walk area and the original museum in the city opening to the public in 1849. The museum has been the inspiration for many people including Lord Attenborough and Sir David Attenborough, who pursued their love of art and natural history as a result of spending their formative years as regular visitors to the galleries. New Walk Museum hosts wide-ranging collections spanning the natural and cultural world. A family friendly day-out, displays include Egyptians, Wild Space, World Arts, Fine Art collections and the Dinosaur & Geology galleries due to re-open in 2011.